1. Ski the morning at Norquay and Tube the afternoon – Mt Norquay has long been a locals hill to take kids with ample beginner terrain and Banff’s biggest tube park. 2. Sleigh Ride along the edge of Lake Louise – the stables out in Lake Louise run family sleigh rides starting Mid December to February, also once the ice is thick enough skating at Lake Louise is a magical experience, with Hot Chocolate available only a few steps away! 3. Lake Louise Ski Resort – Taking the Grizzly express gondola can give one of the best rides to a 360 view of many of Banff’s most stunning mountains. Also Deer Run to Pinecone way or Wiwaxy from the top is a great long cruiser that the whole family can enjoy. 5. 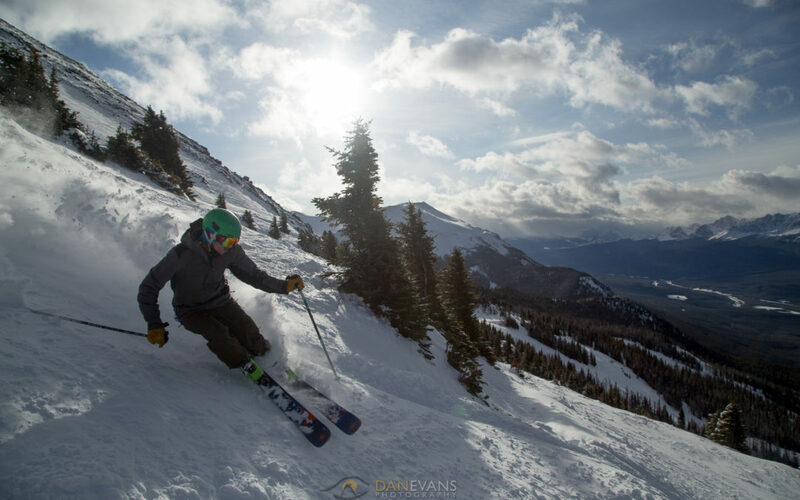 Ride the Contenintal Divide chair and go through 2 Provinces on one chair at the peak of Banff Sunshine.